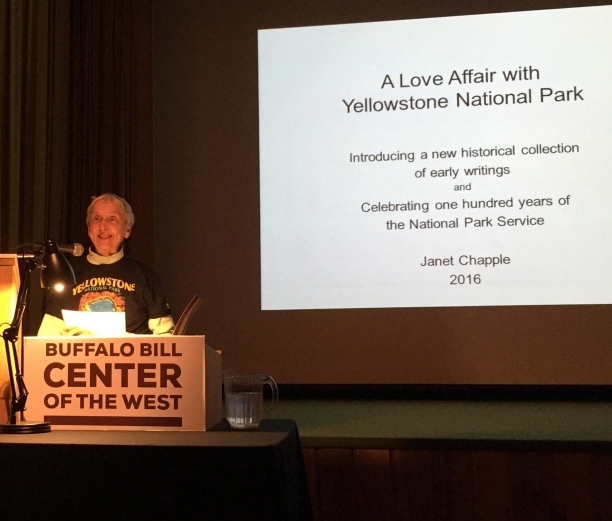 Biographical information about Janet Chapple, author of Yellowstone Treasures and co-translator of Yellowstone, Land of Wonders. We’re celebrating at Granite Peak Publications since we learned that our historical anthology, published in 2016, has a good chance of winning top recognition for that year! 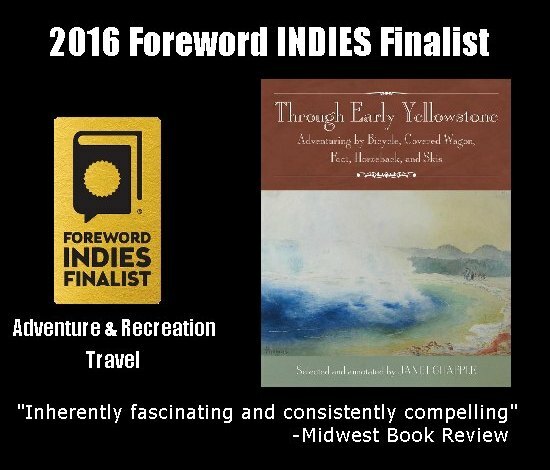 Through Early Yellowstone: Adventuring by Bicycle, Covered Wagon, Foot, Horseback, and Skis is a finalist in two categories in this year’s contest run by Foreword Reviews, the foremost organization in helping promote outstanding independent press publications. The categories we entered are: Adventure & Recreation and Travel. During the 21st century I have loved researching in libraries on both coasts and in Montana and Wyoming to locate the best early Yellowstone writings that need to be preserved in a modern book. By 2003 I had divided my findings into 11 categories, including early expeditions, the public entering the new park, early visits by various means, wildlife, poetry and songs, and other subjects. Wow! Even a sampling of the 85 articles I’d read and enjoyed by 2003 was way too much to fit into one collection. Still, I kept reading. By 2007 I had read a great deal more but managed to pare my findings and categories down to a manageable number of articles and thought it was time to start seeking a publisher. Compiling what I was then calling Magnificent Playground required using my subjective judgment to reproduce the best written and most entertaining of these. In my letter to one university press, I acknowledged my awareness of two other Yellowstone historical anthologies, Old Yellowstone Days, edited by Paul Schullery, and Ho! for Wonderland, edited by park historian Lee Whittlesey and Betsy Watry. I intended to complement these two predecessor collections, not to compete with them. I wanted to avoid repeating descriptions of the many wonders of the park as much as possible, while giving readers a fascinating taste of early, long-out-of-print visitors’ accounts written by entertaining and talented writers and intrepid adventurers. My editor/publisher/daughter Beth and I decided to publish the book with Granite Peak Publications, which up to that time had concentrated on putting out Yellowstone Treasures. Beth was particularly good at eliminating authors I had become enamored of but who did not fit well into the collection for our readers. I decided that we needed to include the short writings that I call snippets to show how the idea of an area that begged for preservation as the first national park gradually became a prime destination for travelers from all over the world. The completion of the Northern Pacific Railroad (NPRR) across Montana in 1883 made access to the park much more convenient than before. A majority of the accounts in Through Early Yellowstone were written by people who used the NPRR and then traveled by horseback or horse-driven coach. Automobiles entered the park for the first time late in the 1915 season, and by 1917 they had taken over completely. It seemed to me the logical point for this anthology to end. I am proudest of having found and been able to reproduce twenty-seven watercolor sketches, which (as the artist wrote to a friend) “are almost untouched travel sketches, quite half, if not more, of the Park ones being taken on the logger-head of the Mexican saddle of my Cayuse [Indian pony].” The artist, Thomas H. Thomas, visited from Wales in 1884. He wrote a delightful two-part article for a London magazine called The Graphic that turned many of his watercolors into engravings. In my book we reproduce many of the engravings along with his articles and roughly half-size reproductions of his watercolors. These reside in the archives of the National Museum of Wales and have never before been seen in this country. This fall Janet has been taking the new historical anthology on the road, explaining her research and discovery of the stories and artwork in Through Early Yellowstone: Adventuring by Bicycle, Covered Wagon, Foot, Horseback, and Skis. On September 9, 2016, she was invited to present a slideshow at the Buffalo Bill Center of the West in Cody, Wyoming. Her title, “A Love Affair with Yellowstone National Park,” allowed her to tell the story of her early childhood in the park, her repeated visits, and her research and writing about Yellowstone over the years. Tidbits of her biography are told elsewhere, such as on the About Us page and in an article called “Celebrating an Old Faithful Area Seventieth Anniversary,” published in August 2009 in The Geyser Gazer Sput (see “Janet Celebrates Her 75th Anniversary in the Park” for some fun stories). But in this lecture she also explained a lot about her research that led to the anthology and the beautiful centerpiece of watercolors. I spent about a decade reading everything I could get my hands on in libraries on both coasts and at the University of Wyoming library and the Yellowstone Heritage and Research Center Library on the northern border of the park. I found that tens of thousands of documents have been preserved. Writers about the Yellowstone area and then the new national park included explorers and adventurers, government expedition members, geologists, artists, park employees, army and administrative personnel, tourists, journalists, and lecturers, all of them thrilled with the wonders they had found. After reading about 250 of these, she, with my help, finally settled on eleven major accounts, many of them illustrated with engravings. These were mostly magazine articles published during 1871-1916, with a few chapters from books. You’ll find the table of contents here, if you are curious and don’t own the book yet. Back to the story. Here she describes her big find, the watercolors from 1884. While researching in the Yellowstone Heritage Library, I came across correspondence between Park Historian Lee Whittlesey and a geologist named Alan Channing from Cardiff University, Wales. Channing had done some research in Yellowstone and had become fascinated with the park. Knowing that Thomas H. Thomas, one of my favorite early Yellowstone authors, came from Cardiff, and wondering about the source of the engravings of his Yellowstone scenes, I got in touch with Dr. Channing. He told me that Thomas’s original sketchbook and notebooks were held in the archives of the National Museum of Wales. Then, in 2008 I got to travel to Wales and see the Thomas watercolor sketches in the archives of their museum. Janet gave substantially the same talk this week at the Bill Lane Center for the West at Stanford University in California. There she regaled the audience with tales while they munched on a lunch that Stanford provided. She has not booked her next event yet, but you are welcome to contact her to suggest one! At the invitation of the publisher of the travelogue by Jules Leclercq that I translated with my colleague Suzanne Cane, Yellowstone, Land of Wonders, I’ve recently written about my personal connection with Yellowstone National Park for their website. Reflecting a lifetime association with the park—or, at least, a strong association during some of my very early years and then again since the age of sixty—I’ve written about my early memories of being there and why Yellowstone means so much to me that I continue to research and write about it during years when I might be taking it easy. I hope my blog readers might be inspired to reward themselves with repeated visits to this richly fascinating and incomparable national treasure. Photo credit: The image of the Old Faithful Inn fireplace from Bat’s Alley is an NPS photo. The countdown to my getting back to Yellowstone is down to seven days now, and the excitement grows! Anticipating seeing my favorite geysers and places and visiting with friends while I do it, I can hardly wait. So there’s lots to be done before I leave, and maybe you’ll forgive me if I go back eight years to a blog post I wrote when I was still blogging on Amazon. In those blog posts I was reminiscing about my unforgettable four childhood summers (beginning in 1939) at Old Faithful, where my father was working in the Inn as Transportation Agent, and my mother took my sister and me to wonderful places, always driving, since she didn’t like to walk. So, from 2007, here goes. . . .
Two geysers we saw quite often when I got to live at Old Faithful were Great Fountain and Lone Star, both accessible by road in those days. We would take a lunch and a book or our game of Parcheesi and drive out north or south to wait for these geysers to erupt. It seems to me we would often have them to ourselves. To the left is Lone Star Geyser by Barbara Lasseter, from Yellowstone Treasures, page 106. The most thrilling geyser viewing experience I can remember was being roused in the night to drive over to see Giant erupt. Daddy took me on his shoulders so I could see over the crowd. Somehow, the group excitement made more of an impression than the actual eruption! According to George Marler’s Inventory of Thermal Features, the first half of the 1940s was a relatively quiet time for Giant, so I was privileged to be there at an eruption. And the next time I got to see one was on July 3rd, 2006—again with a lot of excited viewers. Recently Giant has been erupting quite reliably every few days and thrilling hundreds of us. [Oops! Not these years. Giant hasn’t erupted since 2008.] You can sometimes even see the huge steam cloud from its eruptions on the Old Faithful Webcam. It wasn’t until I was an adult that I learned there are actually hundreds of active geysers in Yellowstone, maybe 500 of them, but changing all the time. Each one has its own shape, size, and personality. There are many “geyser gazers” who go to the park only to watch and study the geysers. Editor Beth alerted me to a USA Today poll of their readers’ favorite lodges. Looking at the list of twenty to choose from leads me to fond memories of those eight lodges where I’ve stayed over the years. It also reminds me of about six or seven I would still love to visit. Well, I have to admit I started making a list of places I want to go, many of them national parks, when I was eleven or twelve—and I still have that little notebook. 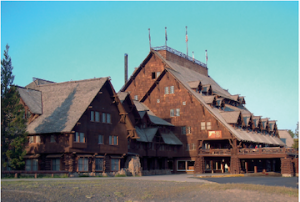 You can easily guess what lodge I will vote for—the one I like to consider my second home, Old Faithful Inn. Another correlation that interested me was to see whether the poll included all the sixteen lodges in Christine Barnes’s beautiful 2002 book, Great Lodges of the National Parks. Answer: No. A good many of those in the book are not in the poll, but the poll offers ten others not in the book. Those in both lists are the Old Faithful Inn, the Ahwahnee, Crater Lake Lodge, El Tovar, Bryce Canyon Lodge, Grand Canyon Lodge, Glacier Park Lodge, Many Glacier Hotel, Paradise Inn, and Yellowstone’s Lake Hotel. Ms. Barnes includes other great lodges in her second volume, published in 2012. Just for fun, I took a personal poll of the ones I’ve stayed in so far. I came up with seven besides Old Faithful Inn. Coming in a close second to OFI would be Death Valley National Park’s Furnace Creek Inn. 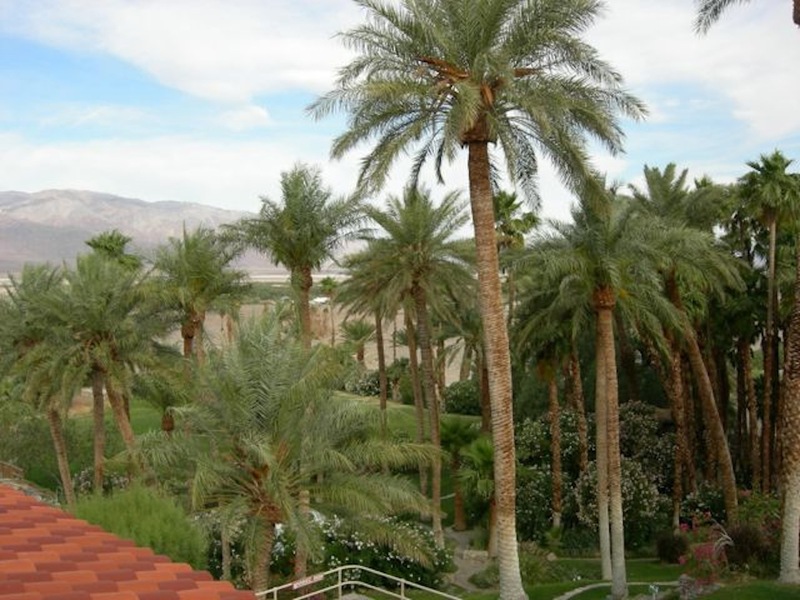 The Inn sits above an amazing oasis, a terraced garden with palm trees, a small cold stream, and a little pool with water, all from a spring in the hillside. It has a gorgeous, big swimming pool, and its excellent dining room and comfortable rooms are where I would rather relax than in any place else in all the months when much of Yellowstone is closed, especially March and April. The others I’ve enjoyed are Jackson Lake and Jenny Lake Lodges in the Tetons, El Tovar in Grand Canyon National Park, the Ahwahnee in Yosemite (although this one needs a second visit from me, because it was not fully open when I was there), Wuksachi Lodge in Sequoia National Park, and what the concessionaire now calls Lake Yellowstone Hotel. I can’t happily accept that name, because its historic name is Lake Hotel (and the lake’s name is Yellowstone Lake, not Lake Yellowstone). My unsubstantiated theory is that some PR person a few years back decided lengthening the name and reversing its words had more cachet. One other way I enjoy the lodges in the Great Lodges book is to extend my wish list. 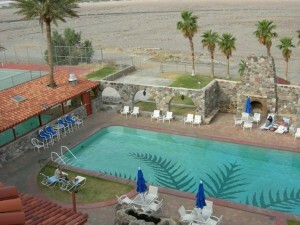 When I last visited the Grand Canyon I was too late to reserve a room in the Grand Canyon Lodge. 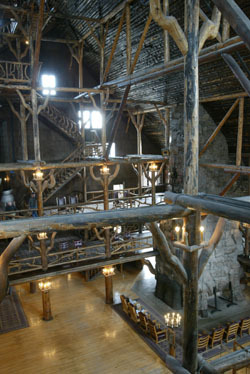 But I was too early (before its opening on May 15th) to see the North Rim and its lodge, which isn’t on these lists. Other times I was also too late when I tried to reserve at Crater Lake Lodge and the Lodge at Bryce Canyon. In Glacier Park I’d love to stay at either Glacier Park Lodge or Many Glacier Hotel, and if I visit Mt. Rainier I’d stay in the Paradise Inn. Place your own vote by March 30th at this USA Today website. Photos are by Jens Paape (Old Faithful Inn, page 75 of Yellowstone Treasures) and the author. A United Kingdom website called “The Independent” last week passed on one misleading interpretation and one, to me, amazing coincidence. their headline, “Yellowstone Park hot spring turned green by good luck coins tossed in by tourists,” seemed to imply that the metal in coins had caused the color of the pool to change. However, they clarified it in their article, explaining that a prodigious amount of tossed-in debris had caused the spring’s temperature to be lowered, allowing the colorful types of bacteria that love heat—but not too much heat—to grow far down into the pool. is one from the June 1940 National Geographic (but uncredited) that I discovered while researching for Yellowstone Treasures. “The Independent” admitted to retouching the image, which looks bluer and generally prettier than it does in my copy of the old magazine. But the real coincidence here is that the woman seated on the right is my mother! She was playing music during summer of 1939 in Old Faithful Inn with the other four women in the picture, who called themselves The Ladies’ Ensemble of Billings (Montana). Margaret Orvis (my mother’s name at that time) played piano with the group for tea in the afternoons. Then she took up the drums to play with them in the evening for dance music. I doubt that Mother ever knew her picture was in the National Geographic! That was the summer I played hide-and-seek with my sister Joan in the inn. 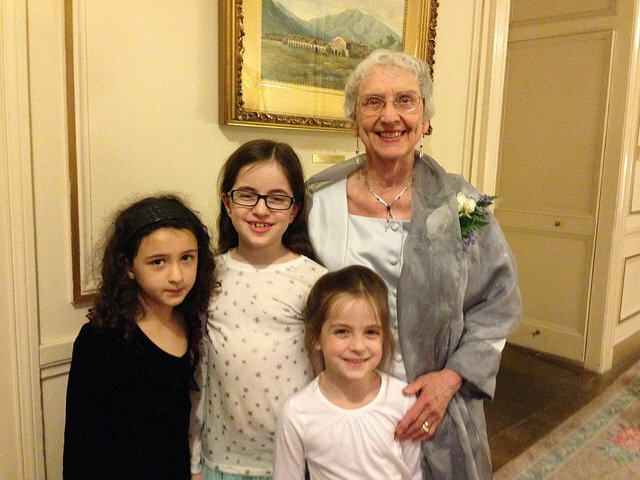 Janet with three of her four granddaughters, ages 6, 8, and 10. This February, guidebook author Janet Chapple was pleased to celebrate her birthday with a banquet at the Bellevue Club, in Oakland, California. Family and friends traveled from far and wide to join the party. Four of Janet’s friends played a Haydn string quartet for us. One guest, a violinist, revealed in a short speech that he learned on a trip to Yellowstone how highly regarded the book by his musician friend really is. A park ranger told him that Yellowstone Treasures was the best guidebook to the park he’d ever seen. He realized then that the book was by the cellist he enjoys playing chamber music with. 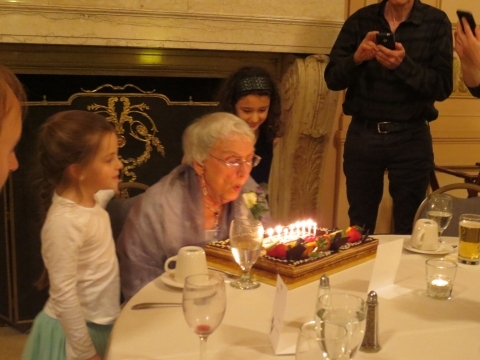 Two granddaughters, one from New Jersey and one from Berkeley, watch Janet as she blows out her candles. After dining on sea bass, salmon, or filet mignon, the approximately 40 guests, myself included, got to try this lovely layer cake. Is It the End of Night for Our National Parks? “There goes another one!” Joan pointed out, as we lay on our flat porch roof in Billings, Montana, watching the August meteor shower. It was 1947, and in our small town we could see millions of stars and pick out several constellations. Sometimes we could even see the Milky Way. Now it’s 2014, and even in Yellowstone this past summer, I could barely find the Big Dipper. Was it that our entire atmosphere is polluted, or was there now too much ambient light even at Old Faithful and Mammoth Villages to enjoy the stars? Listening to a National Public Radio broadcast the other day, I became absorbed in the story of what has happened to the night skies in America in the past few decades. NPR was interviewing author Paul Bogard about his book The End of Night: Searching for Natural Darkness in an Age of Artificial Light. Use “Look Inside” for Chapter 9 on the Amazon website for light pollution images, a sample of what’s in the book. 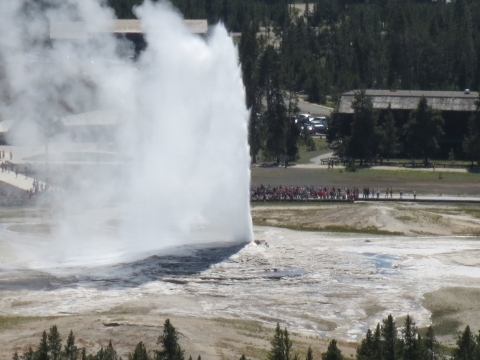 In this last installment of this series of her park memoirs, Janet focuses on her geyser memories. If you are just tuning in now, you might want to start with her first post in the series. The bunkhouse room we slept in faced Old Faithful Geyser. Of course, we watched it often, but we rarely went close. I do not know whether other predictable geyser eruptions were posted in those days, and we never went to wait for Grand or Riverside. I see from George Marler’s Inventory of Thermal Features of the Firehole River Geyser Basins (Geyser Observation and Study Association, 1994) that Grand’s average eruption interval was something like 38 hours in those years. Two geysers we did see quite often when I got to live at Old Faithful were Great Fountain and Lone Star, both accessible by road in those days. We would take a lunch and a book or our game of Parcheesi and Mother would drive us out north or south to wait for these geysers to erupt. It seems to me we would often have them to ourselves. The most thrilling geyser-viewing experience I can remember was being roused in the night to drive over to see Giant erupt. Daddy took me on his shoulders so I could see over the crowd. Somehow, the group excitement made more of an impression on me than the actual eruption! According to the Marler Inventory, the first half of the 1940s was a relatively quiet time for Giant, so I was privileged to be there at an eruption. And the next time I got to see one was on July 3, 2006—again with a lot of excited viewers. 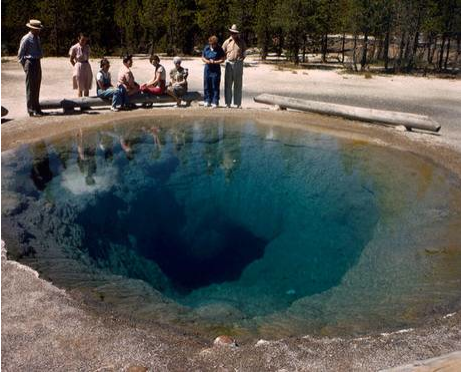 Besides going to Lone Star or Great Fountain geysers, we often visited Biscuit or Midway geyser basins. 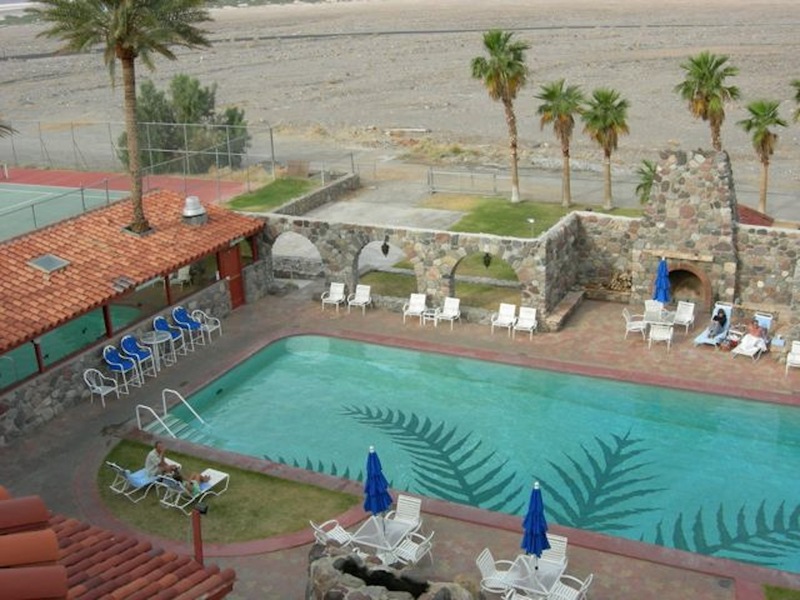 I remember that the surrounding “biscuits” at Sapphire Pool were outstanding; they were destroyed when the pool erupted after the 1959 Hebgen Lake earthquake. I now realize how extrememly fortunate I was to spend so much time during formative years in the magic environment of Yellowstone. It is ironic that one of the most potentially dangerous places in the world—the Yellowstone Caldera—is also, if one takes sensible precautions, one of the safest. Our months in the park were some of the most benign and happy of my life. No doubt this is why in my later years I have been thoroughly engrossed in learning and writing about the park I love. ON THIS WEBSITE: Be sure to see the nugget called “Wonderful Geysers Not to Miss,” and there is a lot more information about geysers elsewhere on the site and, of course, in the guidebook. 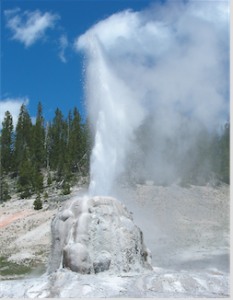 The full article “Celebrating an Old Faithful Area Seventieth Anniversary,” was published in August 2009 in The Geyser Gazer Sput, Vol. 23, No. 4, pp. 5-8. 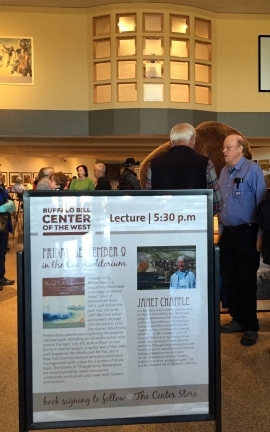 Janet wrote a longer version of these memoirs at the instigation of Park Historian Lee Whittlesey, and they are now preserved in the library of the Yellowstone Heritage and Research Center in Gardiner, Montana. My sister Joan was a life-long games person, becoming a fine contract bridge player and a tournament Scrabble player in her later years, besides making games out of every chore in her life—including the routines she recommended to her piano pupils. She could make a game out of anything, including something as simple as balancing on the logs that surrounded the Old Faithful Ranger Station and Museum. We would collect state names on license plates to see if we could find at least one car from each of the then 48 states. And we played lots of card games and board games, too. As often as Mother would allow it, we would go into the museum to mosey around and talk to the rangers. One of the rangers called us “Dimples.” Perhaps he was the same one who gave us a copy of Cubby in Wonderland by Frances Joyce Farnsworth and signed it “From Ben Lundquist, 1942.” We loved that book and its sequel, Cubby Returns. Some years ago I read those books to my grandsons. I remember the specimens of park rocks in the museum and the samples of plant matter such as the cones and needles from the different evergreens of the park. There were a few small stuffed animals. I think there was a large bear, too, but I’m not sure about that. I would have stayed well away from it. In back of the ranger station and museum was an amphitheater with a screen (now part of the huge west parking lot). I don’t remember the pictures shown on the screen or the subjects of the rangers’ talks, but I do remember well the sing-alongs that always ended the evenings. I know we sang “Home on the Range” and “She’ll Be Coming Round the Mountain,” and many others. Our local world was bounded by the Inn, the bunkhouse, the museum, and the geyser, but I remember that a favorite place where Joan and I played was around the bridge over the Firehole River behind the geyser. To this day I am strongly attracted to that spot, and I always spend a little time there early in the morning when I visit Old Faithful. 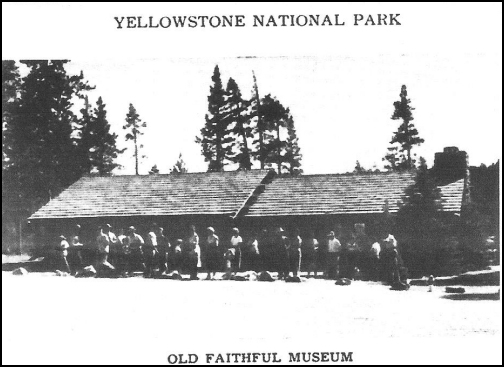 More from Janet’s memoirs in the last post of this series . . . .
CREDIT: The photo of the Old Faithful Museum is from the Haynes Guide, 1953.